AngelouEconomics, an economic development consulting firm, has been tapped by the Savannah Economic Development Authority to partner to develop a Competitive Positioning, Target Industry Economic Development Strategy and Action Plan - or as we are calling it - Propel Savannah. For more information on the plan, visit here. 20% of residents that took the survey make less than $50,000 and 9% make less than $35,000. This tells us we’ve captured a cross section of lower-income households. 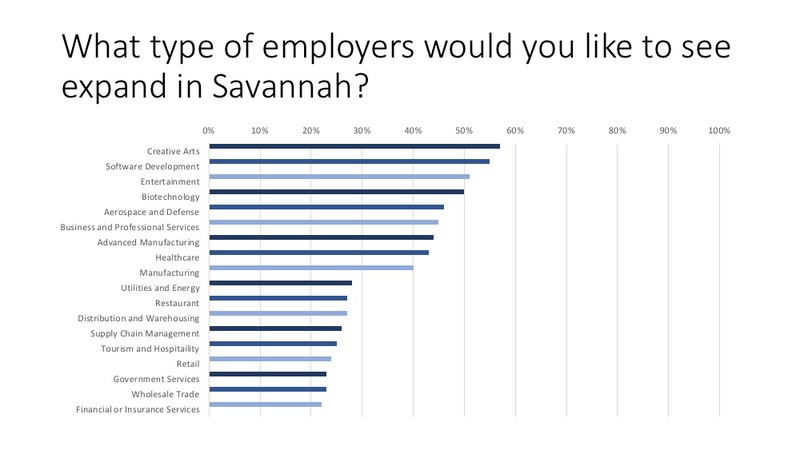 Respondent’s top five employer types they would like to see recruited or expanded in Savannah include: Creative Arts, Software Development, Entertainment, Biotechnology and Aerospace/Defense. 60% of business respondents have less than 25 employees. This tells us we’ve captured the needs of small business. There is a significant disconnect between the strong desire of businesses to attract and retain talent and their satisfaction with this important factor. 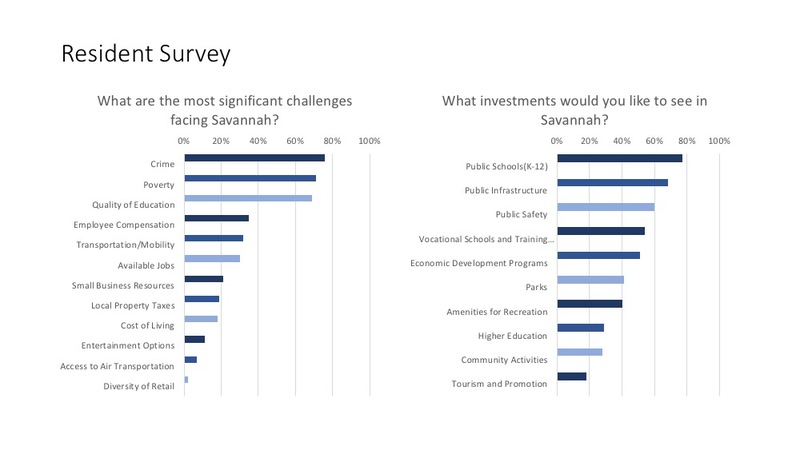 Survey respondents listed primary reasons that are Savannah’s greatest assets as Cost of Living, Port of Savannah, History, Quality of Life, Weather, Beauty, cultural, Activities and Industry. Additionally, the below graphs illustrate additional survey results. While the focus of the Propel Savannah plan will be on the items that SEDA has under its purview of economic development programs, the online community survey results make it clear that SEDA’s strategic partners must continue to play a collaborative role in building a higher-level, sustainable economy. As of September 1, we have entered the second and third phases — Competitive Positioning Analysis and Target Industry Assessment. The results from these phases will be completed near the end of October. The plan will be released in 2019. This website will be updated as the study progresses, so check back often. If you would like to be added to our email list or have ideas, please email us at propelsavannah@seda.org. We look forward to updating the community regularly on the progress and sharing a final plan in 2019.